Every prospect within a pool can have a unique ask amount that displays to the assigned volunteer when viewing their prospect list. Here at EverTrue, suggested ask amounts live at the pool level, which means that a prospect can have different ask amounts in different pools. Ask amounts can be manually entered (or adjusted) in EverTrue's Volunteer module or imported using our volunteer file when getting your prospects in place. If you're looking to import ask amounts with your prospect assignments and pools, please reference our Volunteer file guide. Importing ask amounts is great if you already have ask amounts stored in your database. 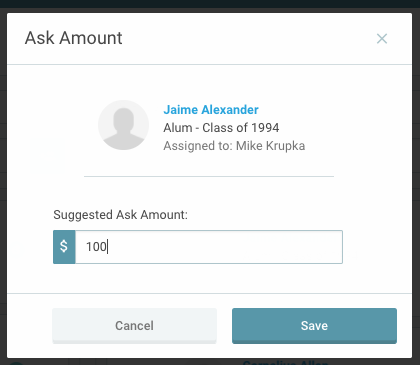 However, if your institution stores ask amounts on the constituent level, a single ask amount exists for a constituent, and/or you've already manually created your volunteer pools with prospect/volunteer relationships in EverTrue, please contact genius@evertrue.com for further assistance in getting your suggested ask amounts into the volunteer platform. If you want to import ask amounts after you've created volunteer/prospect assignments, we'll want to walk with you through this process. If you'd like to manually input or adjust ask amounts, go to the pool and prospect you're looking for and use the three dots to the right of their name to "Edit ask Amount."